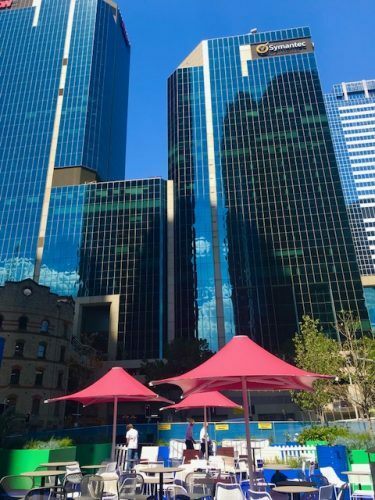 Sydney’s newest neighbourhood is the just freshly built Barangaroo. Barangaroo is located in what was a bit of a no man’s land in the west of the Sydney CBD. Amazing that a city where real estate is as expensive as it is in Sydney that this area went undeveloped! When it comes to things to do in Sydney at night this is Sydney’s newest hot area and is currently mostly frequented by locals. Barangaroo is now high on the list of Sydney highlights. 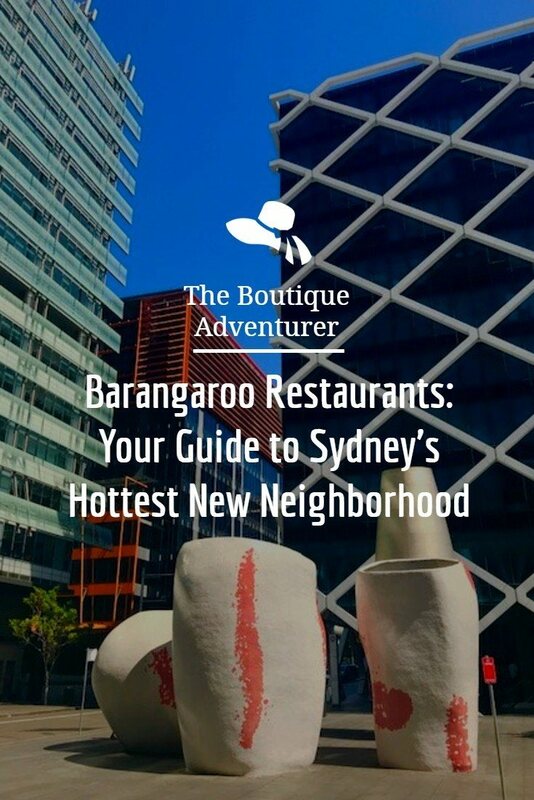 There is some exciting and super interesting stuff going on here when it comes to food so here is my guide to Barangaroo Restaurants. Barangaroo is positioned as The Streets of Barangaroo – a bit of a nod to the popular laneway culture in Melbourne and in Sydney to some extent. 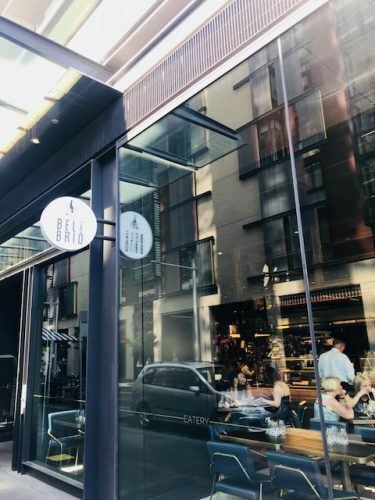 It is clear that all suppliers were given a brief to push the envelope out when it came to design and concepts and the result is a cutting-edge collection of what is hot and exciting when it comes to modern Australian food. The majority of Barangaroo restaurants are, of course, on the waterfront. 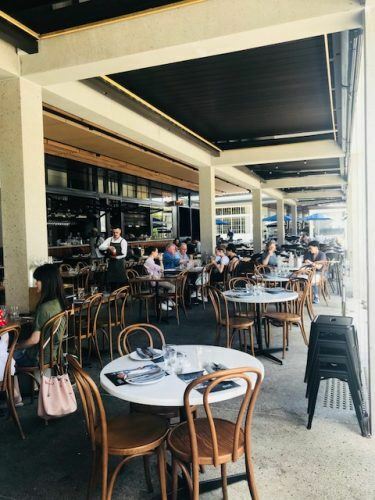 They are the classic Australian model of a small inside seating area and then a large outside eating area with cover for the harsh Aussie sun and Sydney’s tropical rainstorms. 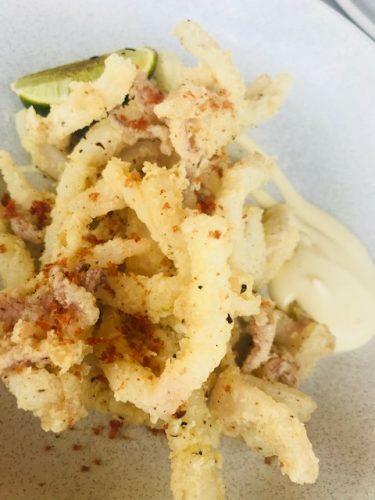 Lining Barangaroo Avenue is a number of interesting and different eats – many brought to you by some of the top names in Australian food. 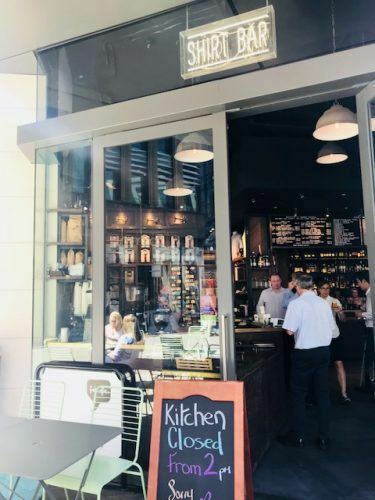 I have visited several myself but have also sought advice from my Sydney based brother who works in the Barangaroo area and is quite the king of lunch! 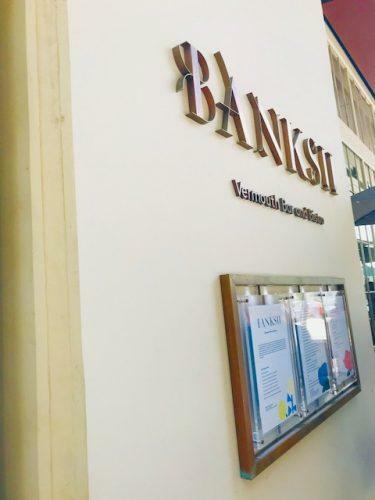 Banksii Barangaroo is one of the hottest restaurants on Barangaroo Avenue. The food is modern Australian but then it also has a “Vermouth” bar. I had never heard of a Vermouth bar but hey there you go! I chose an Aperol Spritz instead as I was severely jet-lagged and thought it wasn’t the time to test drive a new alcoholic beverage but next time I will be there! 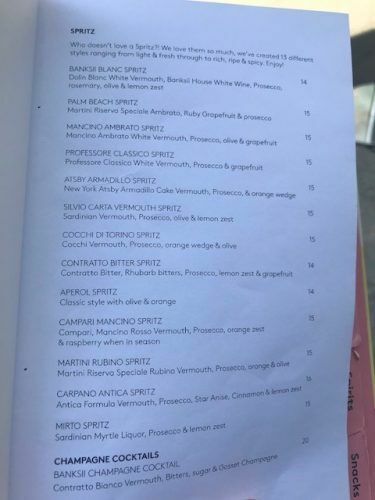 Banksii Barangaroo also has a whole page of spritzes! In addition to this classic, there are Campari spritzes and many Vermouth based spritzes all of which sounded fantastic. My brother highly rates Nola’s Smokehouse when it comes to restaurants in Barangaroo. The smokehouse is all about meat – big platters, bbq and sharing platters. The other place to go for a meat fest is The Meat and Wine Company. If you are looking to spend big on the modern Australian eating front check out Cirrus– it has a big pricey reputation. 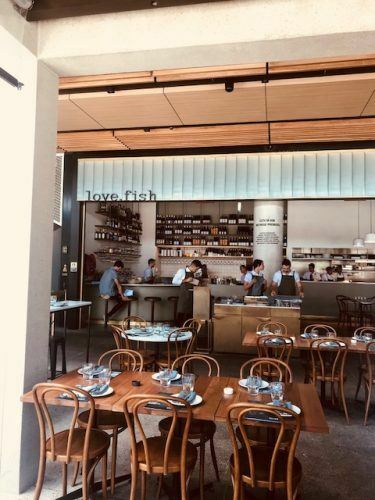 I headed to Love Fish Barangaroo as I was craving some good Australian seafood and I certainly got it! Love Fish Barangaroo is located on the waterfront. As per its name, there is a fantastic selection of aussie fish treats as well as a few meat options. 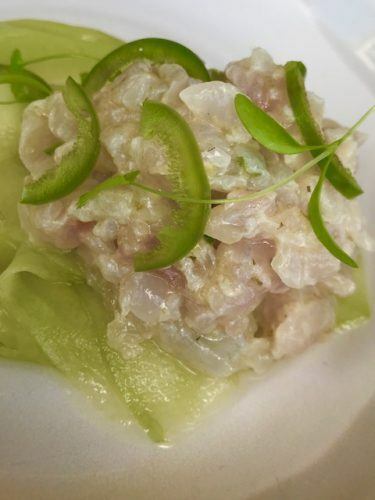 We started by splitting 2 entrees – the snapper ceviche and the salt and pepper squid. Both were delicious although I particularly enjoyed the ceviche. For the main, it had to be Barramundi for me. For those of you who aren’t Australian Barramundi is probably Australia’s signature white fish and I love it. 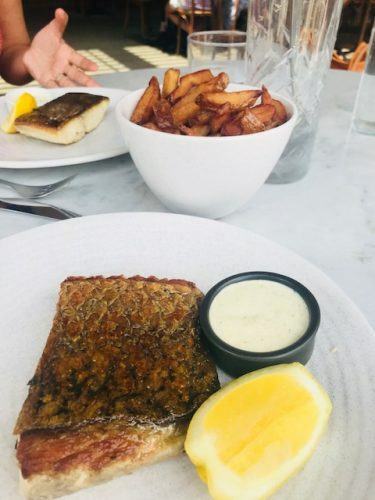 It is a soft and fleshy fish and best served grilled – with some chips on the side! This was a great Barramundi. Refreshing and suprisingly non alcoholic! The service was friendly and fast and the location is absolutely delightful. I also enjoyed an apple mockhito which I can highly recommend. As you would expect in Australia there are a large number of Asian and Asian fusion restaurants in Barangaroo. My brother highly rates the Old Town Hong Kong restaurant which is traditional Cantonese. Lotus also has had great reviews. Lotus focuses on dumplings dumplings dumplings and seafood. On the Japanese front, there are a couple to choose from – Fujisaki and Sushi Hon Izakaya. 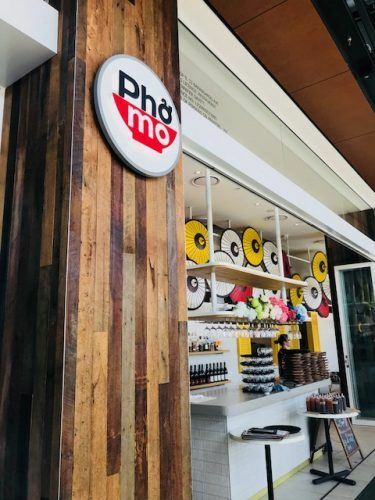 The best name of a Barangaroo restaurant has got to be Phomo! This Vietnamese themed restaurant also has the prime real estate on Barangaroo Avenue but lower prices than most of the restaurants I have mentioned above. The same is the case with Two Sticks which is Chinese with lots of hot soups and cold noodles. And finally, for an Asian snack and drink head to Bing’s Bao and Beer. 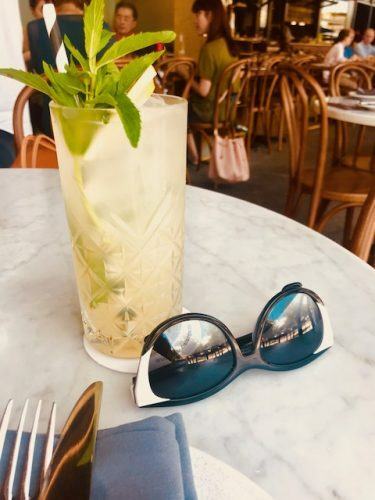 On the European front, Anason is a Greek restaurant on Barangaroo Avenue with a super cute bright blue themed designed and gorgeous wicker chairs to help you feel like you are in Mykonos. Ete is for fine French dining. One of my favourites is Bel & Brio. This is a giant deli as well as a bar as well as a restaurant that is about a block in from the water. 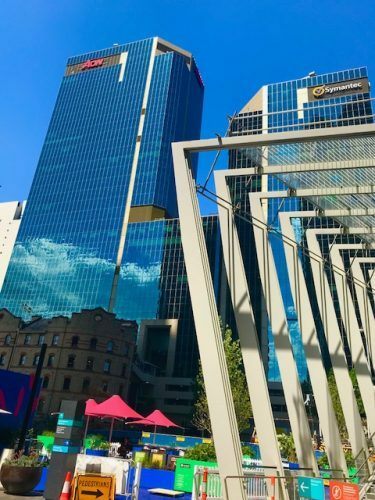 You will want to have an apartment whilst in Sydney if you go here as there is a fantastic selection of delicious looking food – especially the amazing display of yoghurts! I had a great coffee here and they also do a full menu and have a nice looking bar. Barangaroo House is a 3 storey 3 in one concept. The ground floor has an outdoor relaxed feeling and all the main meals are under AUD$30. On the first floor is Bea which is modern Australian and has considerably higher price points. The top floor is Smoke – a fabulous cocktail bar with amazing views. 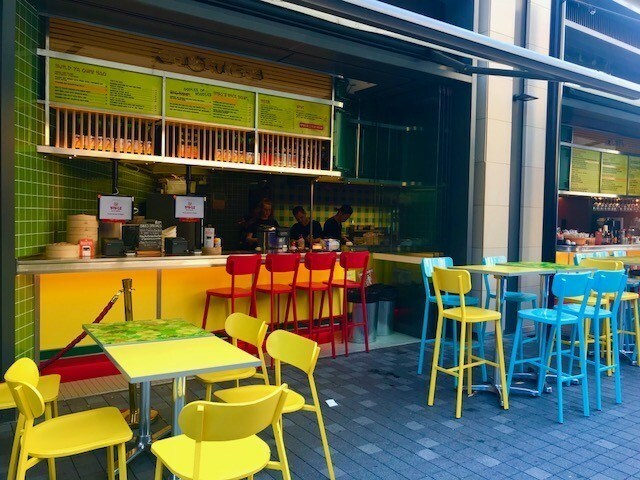 Belle’s Hot Chicken is also located on Barangaroo Avenue. I first visited Barangaroo about 2 years ago when it was mostly still under construction and a pop up of Belle’s was pretty much the only thing open. However, it served some pretty fantastic chicken so do check it out! 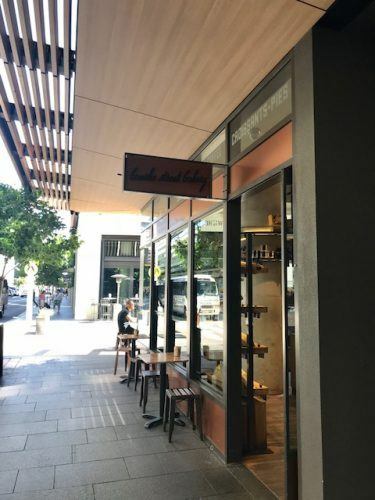 There is also a branch of the brilliant Bourke Street Bakery – home of one of the best sausage rolls you are ever likely to eat and many other extraordinary treats! Don’t miss their sausage rolls! Finally, I had to die for salted caramel ice cream at RivaReno Gelato. 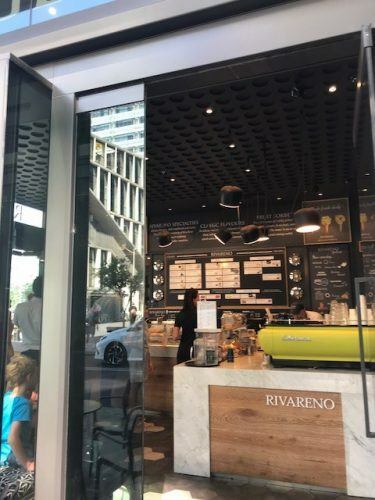 Riva Reno is located one block in from the water and near Barangaroo House. It is a proper Italian Gelato shop and I highly recommend it!!!! The easiest way to get to Barangaroo is to take a train or a bus to Wynyard station. Once you are there it is about a 5-minute walk through a very clearly signed tunnel to head to the road that takes you straight down to the water and the heart of Barangaroo. If you are staying in the Sydney CBD or Darling Harbour it is an easy walk. It is also a fairly comfortable just over 10-minute walk from Circular Quay. 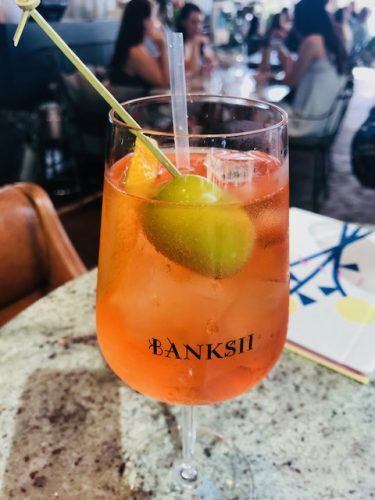 As I noted above quite a few of the restaurants on the waterfront have bars – with a particular call out to the Vermouth bar at Banksii Barangaroo. However, the back streets of Barangaroo also have some hidden gems. 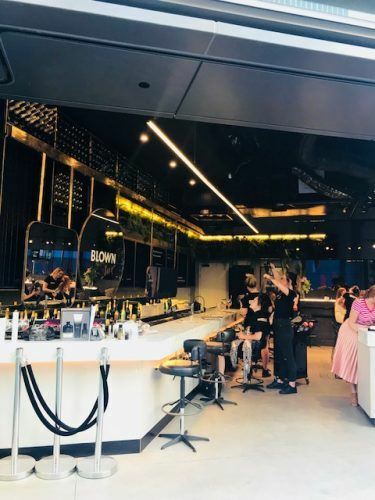 I was captivated by the combination of a bar and a blow dry at Blown! They have a bar which is also where you sit to get your hair done – whilst you are having a drink! What a brilliant idea! And whilst I am mentioning concept bars The Shirt Bar is both a bar and a men’s shirt shop! And it serves food! I do love a concept bar! There are quite a few cute boutiques in the streets of Barangaroo. They tend to be quite modern and small brand focused so rather interesting. There is also a decent sized albeit scaled down David Jones for your big brand needs. A blow dry and a wine – fantastic idea! Barangaroo is still under construction and there are plans for more Barangaroo restaurants. 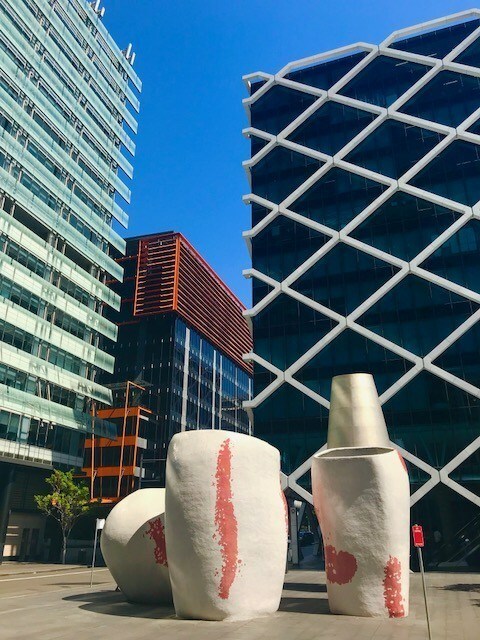 The Streets of Barangaroo website is great for keeping up to speed with all the new openings and what is already on offer in terms of food and shopping. And for bookings you can sort this from anywhere in the world before you go with Open Table. Don’t miss Sydney’s newest neighbourhood on your next trip here! While in Sydney you may also want to check out the lovely Watsons Bay, do a day trip to the Blue Mountains and have a fantastic weekend away in Bowral or climb Australia’s highest mountain Mount Kosciuszko. Food lovers should not miss a trip to Melbourne – Australia’s foodiest city in my biased opinion (it is my home town!). 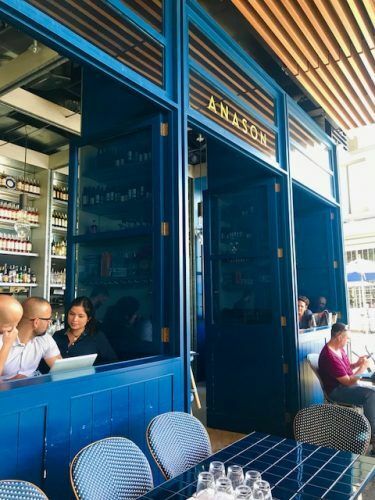 They have amazing brunches, great Mexican and some great food neighborhoods to explore. For foodie weekends away try lovely spa town Daylesford or the beachy Mornington Peninsula. Yes, I am afraid it is a very long flight and there is no way around that! A stopover in Asia is often a good idea to break things up. Check out some great flight deals on Skyscanner here. The only way to make the 24-hour flight not a hideous slice of hell is to find a great deal and go business class! Skyscanner also gives you a good sense of business class prices. 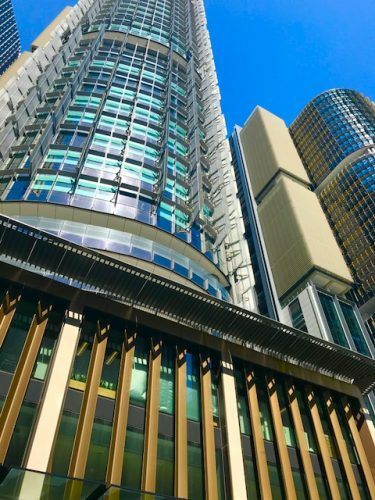 You can’t go wrong staying at a Langham hotel – this is the Langham Sydney which is walking distance to Barangaroo.